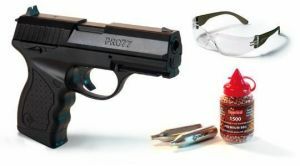 Air pistol Crosman PRO77 Kit 4.5 mm. Air pistol Crosman PRO77 Kit 4.5 mm. in set with two bottles CO2, safety glasses and 350 BBS.